This vehicle is running 26 PSI boost (the recommended limit for VT3 and VNT-17/22 turbos) and using normal pump diesel. It’s pretty standard with stock intercooler, 2.5″ exhaust, 11mm injection pump, and Bosio R520 nozzles. No attempt was made to inflate dyno numbers (no overboost, no diesel cetane booster, no water/meth injection, no propane, and no nitrous injection, etc.). This represents a daily-driven street setup. 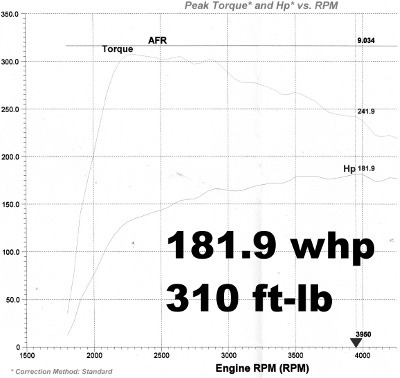 A 190+ whp dyno may be around the corner! The power continues to 4500 RPM and beyond. The camera car is a 1998 Cabriolet with a 1.9L TDI engine swap. It has a VT2 turbo and Sprint 764 fuel injector nozzles (Dynoed 150whp with a conservative 22 PSI smoke-free tune). The Golf you see in the video is the same VT3 equipped car in the dyno video.